Abdeen Palace (photo via Wikimedia Commons). Summary: Egypt’s 2014 constitution establishes that the president is elected for a period of four years, renewable only once. Despite constitutional provisions stating articles on re-election of the president “may not be amended, unless the amendment brings more guarantees,” calls have persisted to amend the constitution and extend presidential term limits. On February 3, 2019, a coalition of representatives submitted a proposal for constitutional amendments that would extend presidential terms to six years and allow presidents to be reelected once (i.e., to serve a total of two terms), allowing the current president to be eligible for reelection under the new rules, and to grant the military authority to “protect the constitution and democracy.” If the amendments are approved, Sisi’s current term would end as scheduled in 2022, but he would be eligible to run for reelection in that year and in 2028. These amendments are packaged among other apparently liberal and progressive amendments that include improved representation for minorities. These initiatives raise significant concerns about constitutionally protected democratic principles, rights, and freedoms, and risk further enshrining a system of authoritarian rule, and they have engendered staunch opposition from Egypt’s civil society and segments of the general public. Legal Context: Under Article 226 of the Egyptian constitution, any amendment to the constitution must be requested by either one-fifth of the members of the House or by the president. The proposal is subsequently submitted to the general floor of parliament for review, where a simple majority of representatives must agree to debate the amendment. Following debate, the amendment must gain the approval of at least two-thirds of the legislature before being sent to the general citizenry for a popular referendum. The amendment goes into effect if a simple majority of voting citizens approves it in the referendum. Article 226 also reads, “Texts pertaining to the reelection of the president of the republic… may not be amended, unless the amendment brings more guarantees.” The effort to amend the constitution—especially the article that the constitution says should not normally be amended—raises significant questions about the state’s adherence to its own domestic legal commitments. The state’s legal stability would also be in doubt, in light of this inability to maintain an unamended constitution for more than five years. Trend Analysis: Discussions about amendments to the constitution intensified and increased in frequency beginning in late 2018 and culminating with the proposal submitted to parliament on February 3. While officials may claim that this initiative will stabilize the country and promote “freedom and equality” through consistent leadership, the calls to amend the constitution four years after its implementation raise questions about the instability that will develop from ongoing changes to the legal system and political landscape. Implications: While there may be some structural flaws and ineffective protections for rights and freedoms in Egypt’s current constitution, an amendment in the current political climate poses monumental risks. Over the past four years, Sisi has overseen an intense crackdown on dissent in which the law has become a tool of subjugation for the state against the media, civil society organizations, and opposition groups, rather than a tool of protection against its reach. While some of the amendments proposed by the government may indeed provide further guarantees as required by Article 226, the extension of term limits will enshrine Sisi’s authoritarian, personal control over the state. Sidestepping constitutional protections against such control renders the very foundations of the modern state—its laws, institutions, and norms—subject to arbitrary interpretation, a dynamic that is inherently unstable and the backdrop against which Egypt has suffered very recent and violent unrest. Background: Per requirements for registering candidacy in a presidential election, by January 2018, Sisi garnered official endorsements from 549 of 596 representatives in the House of Representatives for a second term in office. He later captured over 90 percent of all ballots submitted during the election, amid extensive efforts to limit any challenge to his reelection that included the arrest of opposition candidates and intimidation tactics to convince other candidates not to seek election to office. During this period, Sisi also made public statements that he would not seek to amend the constitution’s regulations on term limits nor seek a third term in office. Nonetheless, since as early as January 2018, some representatives have argued that current term limits are too brief to allow the president to lead effectively, and they claim repeated turnover of presidents will lead to further instability. Media outlets began highlighting the potential benefits of amendments to the constitution in the latter half of 2018 as conversations about changes to the Egyptian constitution intensified, while in July 2018 a petition circulated by a pro-Sisi movement known as “The People Demand” calling for the constitution to be amended to allow for three presidential terms; citizens were reportedly offered financial rewards in exchange for their signatures on the petition. In December 2018, a group of lawyers filed a lawsuit before the Court for Urgent Matters arguing for the Speaker of the House of Representatives to amend the constitution by eliminating presidential term limits pending a national referendum; the case was originally heard December 23 and postponed twice until February 24, 2019. In November 2018, Mada Masr released an investigative report detailing secret meetings held between the General Intelligence Directorate and representatives from Sisi’s office, primarily his son Mahmoud El Sisi, to discuss amendments to the constitution, though the extent of Mahmoud’s involvement in the deliberations is unclear. 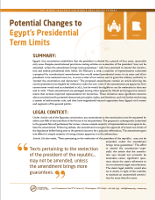 On February 3, 2019, the Support Egypt coalition, a majority bloc in parliament known for its support to the executive’s directives, submitted a proposal to amend the constitution by extending term limits to six years (for which Sisi will be eligible to run in 2022), amid a larger package of amendments that would reintroduce a second chamber of parliament and set forth a quota to provide more protections for minority representation in the government.